Thanks to good workout outfits you will be a true fashionista in the gym as well. It’s actually not that hard! When you have the right inspiration you can pull off any look that you like. First of all, it has to be comfortable, but you shouldn’t forget about fashion. Sometimes even an all-black gym attire can look beyond amazing. These days there are so many trends you can play with, that it will be hard to decide which one to pick first. We decided to round up 20 workout outfits that will upgrade your sporty style. We have shortlisted here 20 of the most trendy workout outfits to wear at the gym for women. You can never get enough of grey when it comes to workout outfits. This is the second all-time favorite color for exercises together with black. All shades are flattering, plus the choice of pieces to buy in grey is quite diverse. 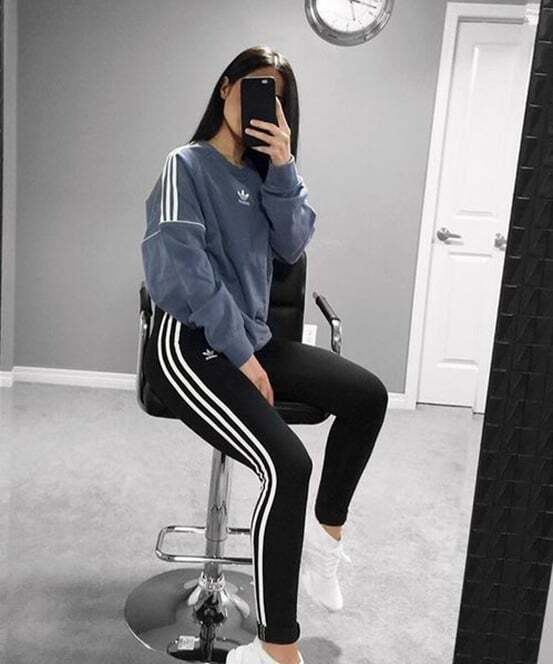 This gorgeous lady found a pair of grey leggings outfit in several different dark hues and worked them with a light grey long-sleeved exercise jacket. It will keep you warm and stylish for all your sessions. This is officially the top trending color of 2018. Ladies can be still in love with Millennial pink in 2019 as well. The alluring shades of pink can turn your gym ensemble into an outfit you can wear outside of the gym as well. You only need to put some extra effort to accessorize it properly. Get a matching set of track pants and a hoodie, add cute sneakers, a bag, and a scarf to keep you warm. It’s officially a fashionista-approved and cute gym outfit to flaunt at a coffee meet with friends. Red is without a doubt the most daring color of them all. And you’ll be surprised to hear that it’s also the perfect one as workout outfits. It sure does look best in a monochrome attire. Don’t be afraid to experiment, exercising is all about having fun. So next time you really want to debut a bold fashion moment at the gym, opt for red. Only runners will understand how important it is to own a quality pair of tight shorts. You can take these babies anywhere. It doesn’t matter which type of workout you prefer, during summer days, you definitely need a pair. If you want, feel free to add loose shorts on top as well. There’s nothing wrong about including plenty of vibrant colors in your gym outfits. This is actually the right time to get creative since exercising gives plenty of space for neon shades, cutouts, and fun details. Isn’t it so cool when you see another girl rocking green, pink and blue in her workout looks? It can be a little tricky at times, but with the help of the ensemble above you’ll figure it out. Pieces don’t have to match. If we could choose two colors to match till the end of time, those would be black and pink. This duo is so complementary that it is a fabulous, sophisticated find for in and out of the gym. You can work it any way that you like. It can be black leggings and top with a pink jacket or make it mostly pink with hints of black. Workout sessions are your best chance at wearing all the pink that you want. Track pants are such a great investment. With the rise of athleisure, you can see stars rocking their track pants with blazers and still looking on point. If you find a design that you can take out of the gym, don’t think twice before buying. Even if they are a bit oversized, that means you are literally following the latest fashion trends of workout outfits. There are sure times when you want to get out of your home and exercise, but it’s simply too cold. Those are the days when you need a chic puffer jacket to keep you warm. The puffer is definitely a piece you’ll be wearing quite a lot and for many years. That means that you shouldn’t be cheap when purchasing it. The best part is that it will also become a staple in your everyday gym outfits. Show off your toned abs in a cropped hoodie or a top. The best match is always with vibrant leggings, but this combo would definitely work with track pants as well. Make sure that it’s a high-waisted pair since you don’t want to put everything on display. Once you get to the gym you can even take off the top and flaunt the body in a sports bra if you feel confident enough. Get on trend with your fun geometric workout outfits. These details together with mixing complementary colors is a cute way to really stand out. Fashion is not about boring combos anymore. Everyone wants to be cooler and noticed everywhere. If you are a huge fashion maven, you should copy this great gym look right away. We love multipurpose fashion! This is one of those outfit ensembles for workout that you can work from day to night with a few simple changes. It will be very comfy and on trend as well. Layers are popular in every aspect of fashion. First of all, you will feel much more comfortable when exercising outside. Even if it’s cold, you’ll have your hoodie and jacket on. The second part is that it looks very good, especially when done in several different colors. Rose gold is such a flattering color for clothing. Women are obsessed with it when it comes to all other departments, including home décor, makeup, beauty and more. That’s why it’s an amazing idea to add this shade to exercise outfits. It is great for all skin tones and styles. These pieces are so eye-catching that everyone will be asking where you got them. You can find so many leggings, and tops with a metallic shine to them to upgrade the final outfit for workout. Even wearing rose gold from head to toes is approved by the latest trends. Floral prints are such an amazing way to elevate a gym ensemble. Choose them in light pastel colors and you’ll never be sorry. Even vibrant shades such as pink, green, yellow, blue can be extremely flattering. To show it off much better, choose the rest of the outfit in a single color. For some reason, ladies always feel best when they are wearing black. You will see many women in black tights with a single visit to the gym. They are definitely a safe option which takes away a few pounds from the appearance. Although an all-black workout look is a classic, you can always spice it up with white stripes. Color-blocking is not only a thing on fashion runways. It can also become a part of your workout outfits. Whenever you are headed to a Pilates class, you also want to follow the latest trends. That’s why you should definitely find a chic, vibrant pair of leggings or a sweatshirt. Pair tops and bottoms from the same brand as popular bloggers do. This one looks like quite a comfortable set to wear, so during the holiday discounts, you might even find a similar one. When you get a second peek, you’ll see that the sweatshirt would be so chic with ripped jeans. Ditch the leggings for baggy track pants and a matching sweatshirt. Monochrome attire is huge right now, so you can flaunt it even when you’re going to the gym. Do you know what the best part is? That you can actually show off this gym outfit in public and hang out with friends after a workout session. That chic fanny pack makes it even more fashionable. 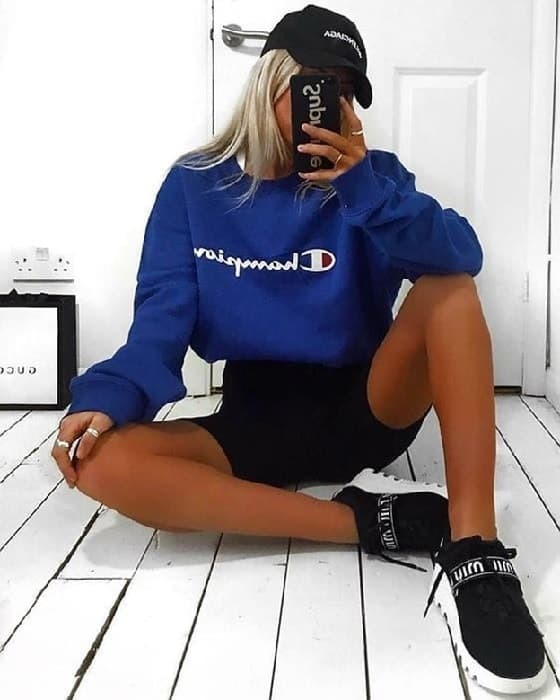 Chunky sneakers are another trend of the season, so use them to upgrade the modern athleisure set. Meet the biggest trend that celebrities can’t get enough of. They rock them for a night out, parties, working out and even a lunch date. This is why biker shorts should become a staple in your cute gym outfits. They are so easy to mix and match. These shorts are flattering for all body shapes and sizes. Work them with a cropped top, sports tee or a hoodie. Either way, you’ll be scoring a very trendy exercising ensemble. Another trending moment in the workout department is mesh details. Use them in sports bras, leggings and even tops. They give that sultry vibe to garments that are still very much appropriate. A tee with mesh details can show off your favorite bra. The leggings will make you look slimmer and more fashionable. A standout combo as workout outfits for modern women.